DETROIT -- The next-generation Jeep Wrangler won't follow the 2015 Ford F-150's lead with an aluminum body. Instead, the off-roader will keep its steel body structure but add aluminum doors, fenders and other parts after Fiat Chrysler CEO Sergio Marchionne said last week that the costs of the switch outweigh the benefits. "We've run the numbers and we've simulated mileage and the impact. 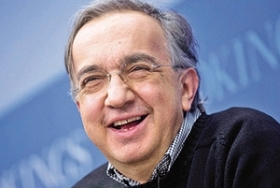 Because of the difference in cost not just of the material but the actual assembly process, I think we can do almost as well without doing it all aluminum," Marchionne said. It's a stark reversal for the man who acknowledged a year ago that there was no better vehicle in FCA's lineup to make from aluminum than the Wrangler. Internal sources with direct knowledge had told Automotive News that the next-generation Wrangler would have an aluminum body. Now, instead of following Ford Motor Co.'s expensive switch from steel for the F-150, Wrangler will follow General Motors' lead of using aluminum strategically to minimize costs. GM decided against an aluminum body for the latest redesign of the Chevrolet Silverado and GMC Sierra pickups last year. Ford spent $359 million and lost about two months of production at one plant converting its pickup plant in Dearborn, Mich., to aluminum. The development is likely great news for Toledo, Ohio, which has been vying to keep the Wrangler in its ancestral home. A steel body means that the Wrangler plant won't have to be gutted to switch to aluminum body construction. The redesigned Wrangler, due in 2017, still has to lose weight to get better fuel economy than its current rating of up to 21 mpg highway. It will do so by "hanging" lightweight aluminum doors and other panels on a steel structure, Marchionne said. "It may go beyond hanging, but it's not phenomenally off hanging," Marchionne explained about the latest plans for the 2018 Wrangler. Even if the Toledo plant can be used without massive retooling, capacity constraints still pose a potential problem. The FCA CEO said he still expects to make a final decision about expanding Wrangler production in Toledo within two months. The Wrangler's 2014 sales reached a record 175,328 in the U.S., its largest market, and through April are up another 22 percent. Toledo and Ohio have offered FCA an incentive package to expand Wrangler production locally. Toledo has acquired a large tract of land west of the plant for possible expansion of Wrangler production. Marchionne's Wrangler reversal could be seen as a solid save for the steel industry. Ford's sales success with the aluminum 2015 F-150 masked the fact that the changeover, which shed more than 700 pounds on some models with an aluminum body and inspired other structural changes, produced solid but modest improvements in fuel economy. The 2015 F-150 achieves up to 26 mpg on the highway vs. a maximum highway rating of 23 for the 2014 model. But Marchionne's main concern may be the production disruption and expense of switching the Wrangler plant to aluminum production. Unlike Ford, which has two plants producing the F-150, FCA has only one plant in the world producing the Wrangler: Toledo Assembly complex. Ford continued operating its Kansas City, Mo., plant while it switched its Dearborn factory to aluminum to keep the supply of F-150s flowing to dealers -- and profits flowing to its bottom line. For FCA, shutting down Wrangler production would mean an immediate shortage and lost sales of one of its most profitable vehicles. Also, Ford at its two F-150 plants replaced steel welding equipment with tools that assemble the pickup with rivets and adhesive. But while Marchionne said that the next Wrangler's body won't be aluminum, he implied last week that the coming Jeep Grand Wagoneer's would be. He said a different cost and benefit calculation regarding aluminum will apply to the full-size Grand Wagoneer. The Grand Wagoneer will be a unibody SUV with three rows of seats and will share a platform and factory with the two-row Grand Cherokee. The Grand Wagoneer is due to arrive in 2018. Marchionne said, however, that the Grand Wagoneer's development might mean a one-year delay in the redesign of the Grand Cherokee, which had been due in 2017. "I think that development [of the Grand Wagoneer] needs to coincide with a complete relook at the Grand Cherokee architecture and effectively jointly develop them. And if there is a delay [in the Grand Cherokee], it's due to the joining of these two programs into something that makes sense," Marchionne said. The Grand Wagoneer, he said, "needs to happen. There's a piece of the market that I think we have not accessed because of the nature of that [current Grand Cherokee] architecture and what it can offer," the CEO said. "I think we need to go there with the next version."